CHICAGO (June 24, 2016) - In its 31st year of honoring the nation's best high school athletes, The Gatorade Company, in collaboration with USA TODAY High School Sports, today announced Bobby Colantonio of Barrington High School as its 2015-16 Gatorade Rhode Island Boys Track & Field Athlete of the Year. Colantonio is the third Gatorade Rhode Island Boys Track & Field Athlete of the Year to be chosen from Barrington High School. The award, which recognizes not only outstanding athletic excellence, but also high standards of academic achievement and exemplary character demonstrated on and off the track, distinguishes Colantonio as Rhode Island's best high school boys track & field athlete. Now a finalist for the prestigious Gatorade National Boys Track & Field Athlete of the Year award to be announced in June, Colantonio joins an elite alumni association of state award-winners in 12 sports, including Ryan Hall (1999-01, Big Bear HS, Calif.), Meb Keflezighi (1993-94, San Diego HS, Calif.), Derek Jeter (1991-92, Kalamazoo HS, Mich.), Candace Parker (2001-02, Naperville Central HS, Ill.), Mark Sanchez (2004-05, Mission Viejo HS, Calif.) and Lolo Jones (1997-98, Roosevelt HS, Ia.). The 6-foot-3, 235-pound senior won the hammer throw at the State Meet for a third straight year this past season, leading the Eagles to a ninth-place finish as a team. 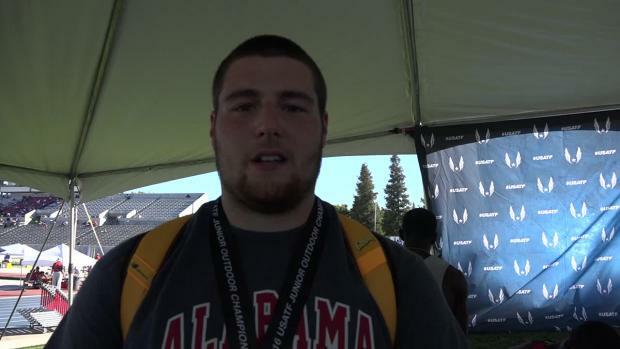 Colantonio's top throw in the hammer of 251 feet, 2 inches ranked as the nation's No. 1 throw in 2016 among prep competitors at the time of his selection and was also No. 5 in U.S. prep history. 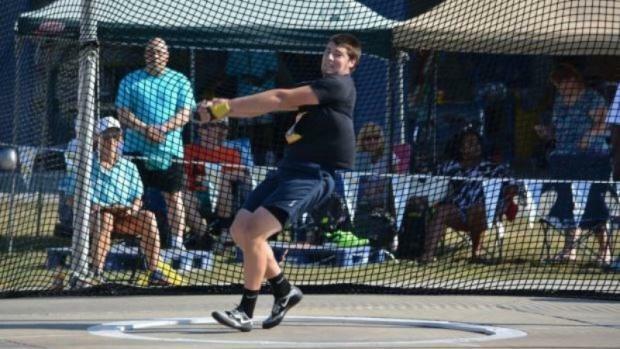 Colantonio won the New Balance Nationals Outdoor championship this past week in North Carolina and is ranked No. 9 in the world in the 19-and-under age group. Colantonio has maintained a B average in the classroom. He has volunteered locally as part of multiple fundraising campaigns to benefit cancer research and as a youth football and track coach. "Bobby Colantonio is an amazing athlete to watch," said Dan O'Kleaskey, head coach of Central High. "He would electrify the crowd every time he released the hammer." Colantonio has signed a National Letter of Intent to compete in track and field on an athletic scholarship at the University of Alabama beginning this fall. The Gatorade Player of the Year program annually recognizes one winner in the District of Columbia and each of the 50 states that sanction high school football, girls volleyball, boys and girls cross country, boys and girls basketball, boys and girls soccer, baseball, softball, and boys and girls track & field, and awards one National Player of the Year in each sport. The selection process is administered by the Gatorade high school sports leadership team in partnership with USA TODAY High School Sports, which work with top sport-specific experts and a media advisory board of accomplished, veteran prep sports journalists to determine the state winners in each sport. Colantonio joins recent Gatorade Rhode Island Boys Track & Field Athletes of the Year Jack Salisbury (2014-15, La Salle Academy), Adam Kelly (2013-14, Barrington High School), Charlie Ionata (2012-13, Barrington High School), Joe Velez (2011-12, Classical High School), Jarell Forbes (2010-11, Classical High School), Kadeem Kushimo (2009-10, La Salle Academy), Andrew Springer (2008-09 & 2007-08, Westerly High School), and Jake Keeling (2006-07, Ponaganset High School) among the state's list of former award winners. To keep up to date on the latest happenings, become a fan of Gatorade Player of the Year on Facebook and follow us on Twitter. For more on the Gatorade Player of the Year program, including nomination information, a complete list of past winners and the announcement of the Gatorade National Player of the Year, visit www.gatorade.com/poy.